Whether you own a car in Apple Valley made by Morris or McLaren or Rambler or Rolls, keeping it running is always a concern. Some people enjoy working on their prized auto and are quite skilled at car repair, while others are totally unable or unwilling to work on their transportation. Even those proud owners who love tinkering with their auto sometimes find that they need to have someone else perform auto care on their car, perhaps because of unforeseen problems or time constraints. 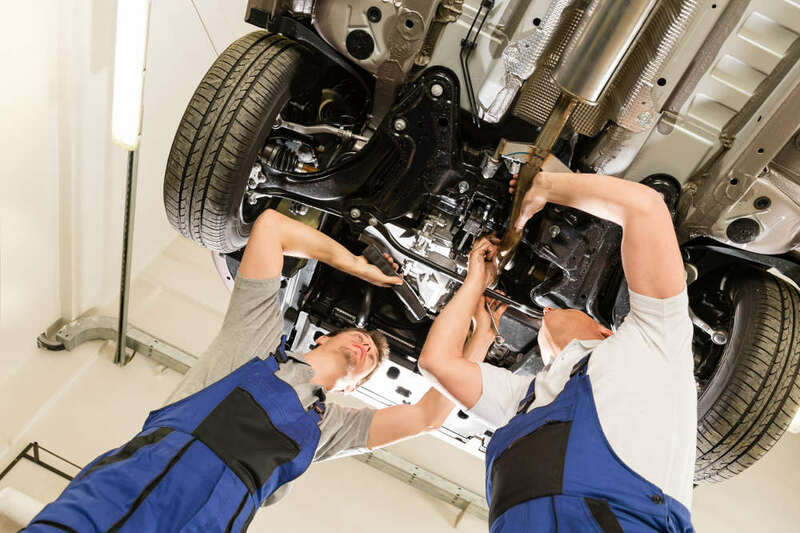 When you need repairs or routine maintenance on your vehicle, having a car repair shop that is both technologically competent and personally concerned is important. 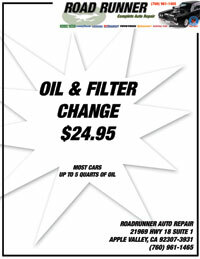 Road Runner Auto Repair in Apple Valley, California fills both criteria. Expect these auto repair specialists to become your personal garage. Rely on them for routine projects such as oil changes and tune-ups and they will be there for any major needs. Mechanics who know your car will often spot major problems before they happen and possibly save significant expenses and inconvenience. If your transmission is nearing the end of its lifetime, scheduling replacement or major repair in advance is far preferable to having a breakdown in morning rush hour traffic when on the way to work. Car repair parts sometimes can take days to find, even in Apple Valley, California. Advance scheduling can avoid long delays that frequently occur after a breakdown. Even when parts are readily available it may not be possible to start work right away. Sometimes car repair problems cannot be anticipated and a business such as Road Runner Auto Repair in Apple Valley offers that combination of professionalism and personal service that means your vehicle will be returned to service rapidly while still receiving professional, quality service. If a service station mechanic just checks your oil when he (or she) looks at the oil dipstick, they may not notice leaking gaskets or even the age of the oil. Checking transmission fluid levels must be done properly for each model of vehicle, and the quality of the fluid is as important as the quantity. If an Apple Valley vehicle has coolant fluid overflow containers, the fluid should be checked for contamination. If the engine is cool, the fluid should be checked. When the fluid is checked, the integrity of the cap should be checked. An improperly operating cap can cause overheating and possible severe engine damage.